In our latest Quick Tip video, we show you just how easy it is to use our sticky easel backs that allow you to stand your printed sheets upright as a sign on a counter top. It’s as ‘easy’ as just fold, peel and stick! Fold the legs back and push down the tab stay. Peel away the two pressure sensitive adhesive liners away. Align the bottom edge with the bottom of your sign and press into place. Then stand up your sign! 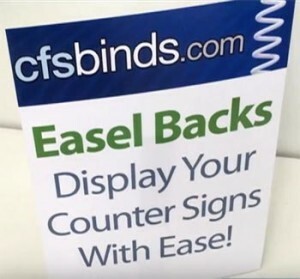 For added rigidity, we recommend that you encapsulate your sign in a 5 or 10 mil laminating pouch first.